Apollo SDK provides developers with a powerful library for consuming media in Windows Phone applications. Three step implementation of windows phone 8 apps that consume media. Out of the box support of most on-line radio stations. 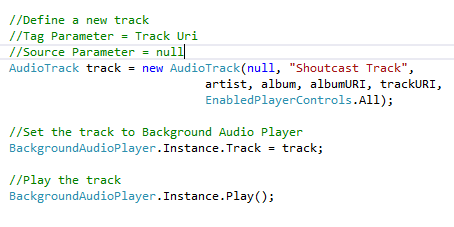 Behind the scenes Apollo SDK relies on the Background Audio Architecture and the open source Windows Phone Streaming Media library. Apollo SDK Team always responds within 48h in any email request. Sample applications are available in order to try your specific urls and audio codecs. 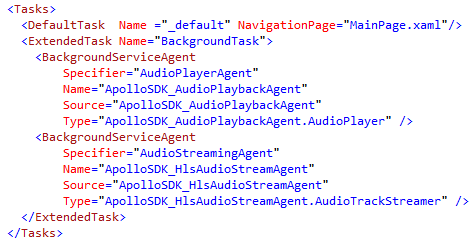 Simply select and add the Apollo SDK dlls in your project. Then, just set the background agents in the app manifest file. Provide a valid licence key provided by the Apollo SDK Team. Finally, consume your media with the powerful Apollo SDK.